Places to see in Beloon Eco Village: While in Beloon Eco Village, you can take a walk on the lush grasslands, alongside River Shibai and watch migratory and local birds frolicking the whole day. You can take a bullock cart ride to roam around the entire village and pluck some garden fresh vegetables and fruits from the farm and enjoy them. But the best thing to do in Beloon Eco Village is to sit idle and watch the boats crossing the Shibai River, the green lush paddy fields swaying like waves with the wind and the endless white ocean of Kash Phool welcoming hope and prosperity of the future. 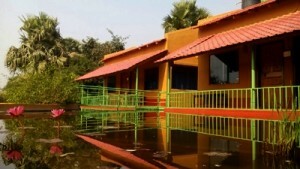 Nearby attractions of Beloon Eco Village: Beloon Eco Village is very near to Choto Pukur, which is a wetland, where animals and migratory birds like White-throated Kingfisher, Bramhiny Duck, Ruddy Shelduck and Wooly-necked stork frequent in thousands every year. Just 15 km from Beloon Eco Village is Attahas which is famous for being one of the “Satipith” pilgrimages of Hindus. 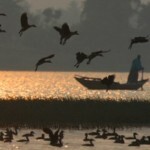 Attahas also has a flourishing population of Fruit Bats and Open – Billed Storks, which birdwatchers would love to spot. 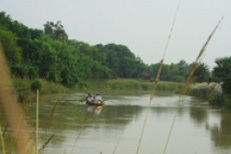 A little far from Beloon Eco Village is Kalyanpur Ghat, where you can still spot the endangered species of Gangetic dolphins frisking on the water. 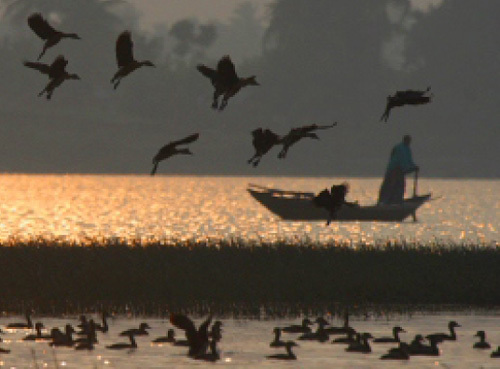 Nayachar, some 20 km from Beloon Eco Village, is an island on the River Ganges, where many wildlife species and migratory birds inhabit. There is a village named Musharu, which is popular for being the home of the venomous cobras, who are worshipped here as deities. Hence this village is also called Snake Village. While returning, you can also visit the nearby major town of Kalna, which is famous for its 108 groups of temples dedicated to Lord Shiva. Things to do in Beloon Eco Village: You can catch fish from the nearby lake and ask your host to cook it while you enjoy rafting in Choto Pukur. In winters, you can enjoy fresh Date Palm juice (Khejur Rosh) in the early mornings and during your stay if someone in nearby village spots a honey comb then you may get the privilege to enjoy some fresh honey too. You can also get engaged in activities like rescuing wild animals and releasing them, studying the behavior of the wildlife and boating on River Shibai. Camping is another popular activity done in this place. You can also volunteer in social activities like teaching, re-vegetation and health checkups. If you visit during the festivals of Bolan Gaan and Jhapan, you can see the local people enthusiastically participating in these festivals. How to reach Beloon Eco Village: You can reach Beloon Eco Village by train as well as by road. 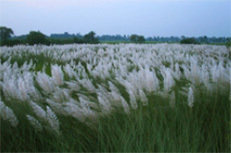 If you are traveling by car, you can take the Durgapur Expressway and drive via Bardhaman to reach Beloon Eco Village. It will be a journey of 3 hours covering a distance of 175 km. When you travel by train, your journey gets divided into two phases. In the first phase, you have to reach Katwa from Howrah, covering a distance of 144 km. In the second phase, you can take a local train from Katwa to Shiblun Halt that is another 10 km, and from Shiblun Halt it is just 1 km to Beloon Eco Village. Best time to visit Beloon Eco Village: Depending on the activities that the tourists are interested in, Beloon can be visited all throughout the year. The monsoons are nice for enjoying the riverside and watching the dark clouds rolling over the green fields, the winters are excellent for bird watching and the rest of the year is filled with all sorts of festivals and fun. Lodging and dining facilities at Beloon Eco Village: Beloon Eco Village offers incredible accommodation facilities suiting your taste and requirements. Here, you would get the true feel of residing in an Indian village. There are 2 waterfront cottages with 4 triple bedded rooms. All rooms are decked with facilities like neat western bathrooms, availability of 24-hrs water and electrical service and other modern arrangements. Another interesting way to stay and enjoy Beloon Eco Village is tent camping in the middle of grasslands in the winters. These tents can accommodate 4-6 persons at a time, and can be placed at a preferred location as per the guest’s demand. The food available here is essentially clean and delicious traditional Bengali cuisine. Depending on the demand of the guests, even some western foods are also available here. The main food that is available here are the freshly caught local fish, and freshly picked fruits and vegetables from the gardens. Photographs by Achintya Bhar, Sudipto Dey. Need 3 rooms this weekend. 16/7/11 to 17/7/11. Kindly contact on my mobile as soon as possible. Please drop your enquiry for booking of Beloon property through the Contact Pg of the website. How much is the tariff of Beloon please ? ?